Gifts for flight attendants – and travelers! 3. OVEN MITTS – The oven racks are hot, hot, hot! This is why so many flight attendants no longer have fingerprints. Because I’m always leaving mine behind on the plane, I can never own too many pairs of oven mitts. Flight attendant Eric is a fan of Grips. As for me, I like Fred’s Hot Head dog shaped insulating mitt. 4. MINI TRAVEL ROLLER SET – Looking good is important to flight attendants. Even though it’s not always easy when our layovers are only eight hours long and we’re scheduled to work ten to fourteen hours a day. Somehow flight attendant Joann always manages to look fabulous and I have a feeling it has something to do with her Conair mini roller set. 5. GREEN TRAVEL/REUSABLE TOTES – My friend Melanie can tell domestic flight attendants from international ones by the bags they carry on their layovers – Harrods vs Trader Joe’s. For just $2.99 you can help them show off their travel style with this fun international tote from World Market. Or how about (sending me) a Loot Bag from Anya Hindmarch, creator of the “I’m not a plastic bag” bag. I’m on my way to becoming a flight attendant myself (have lots and lots of applications standing out.. :)) , and I love reading your blog! 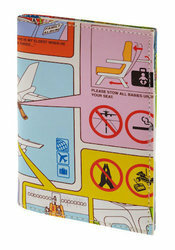 I have a little question: I absolutely love the ‘Safety Misinformation’ passport cover you’ve described above. There’s just one little problem: I live in Amsterdam, and I don’t love the shipping cost (22dollars!) so much… Do you have any idea if I can buy a similar one in Europe somewhere? Thanks in advance for your reply! Try this site http://www.flight001.com/ They have a similar passport cover, as well as other cool travel products. Good luck to you!